Get involved in Art the Arms Fair – attend their 2019 launch event on September 30 2018. Last time DSEI came to town, Art the Arms Fair held a mass, en plein air art event during the Big Day of action. Artists came armed with canvases, clay, and their creativity to the site of the fair to Art the Arms Fair with painting, performance, sculptors and satirists. The work produced was taken to a London Space to be shown alongside other donated art works for an exhibition coinciding with the DSEI Arms Fair 12th-15th September 2017. Work was sold to support the work of Campaign Against Arms Trade. 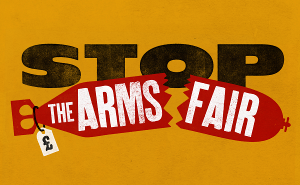 More info on the Art The Arms Fair website. #ArmingTheWorld was a performance collaboration between Ice & Fire, Teatro Vivo and the designer takis. The Paveway missile, the Tactica Armoured Car, CS gas and the Eurofighter formed the centre of a larger performance intervention in the week of the arms fair. The ‘#ArmingTheWorld: Outreach Team’ took to the streets to enter people’s daily lives, provoking new ways of thinking about the arms trade and its impact both here and abroad.